We got new pics of our girl yesterday. She looks like she is two years old. She was standing up in an old, long-sleeved, footed, one-piece PJ outfit with sandals strapped around her little feet. I couldn't help but think about the clothes we have for her here at home that she will probably outgrow while she wears old long-sleeved PJs with sandals. I will say that there has been A TON going on regarding the DRC adoption crisis, as Both Ends Burning's Kelly Dempsey testified in front of Congress regarding the crisis situation and the desperate need to get involved. In addition, Congress requested that BEB create another petition to urge Obama to discuss the situation with DRC's President, Joseph Kabila. No word yet on whether or not that happened, but they did officially meet up at the US-Africa Leaders Summit earlier this week when Kabila was in the US. Secretary Kerry did discuss the situation with President Kabila, but it appears as though there's nothing new regarding Exit Letters. This announcement from DOS basically says nothing, but there it is in case you want to read it. I should also mention that my senator's office (Roy Blunt) has been particularly AMAZING in responding to this situation with empathy and true concern for the kids involved. They email me about once every other week to keep me updated, and Senator Blunt has gotten deeply involved (as have many other members of Congress) to try to bring kids home. Senator McCaskill has also been fairly helpful, often agreeing to co-sponsor resolutions. Billy Long has not been helpful at all, but I do give his ONE empathetic staff member props for pretending to care for a little while there after a friend of mine got his ear and gave me his contact info. Unfortunately, Long was "out of pocket" when I requested that he inquire about a Congressional letter, but the helpful staff member has promised to help in the future in any way possible, and I will let you know how well he makes good on that promise. But that's not really all that has been happening in DRC. Meanwhile, while we are praying and scrambling to get things moving in DRC and dreaming about holding C sometime (any time! ), another little one lost his life in DRC while waiting to join his family (and to receive better medical care) in the US. 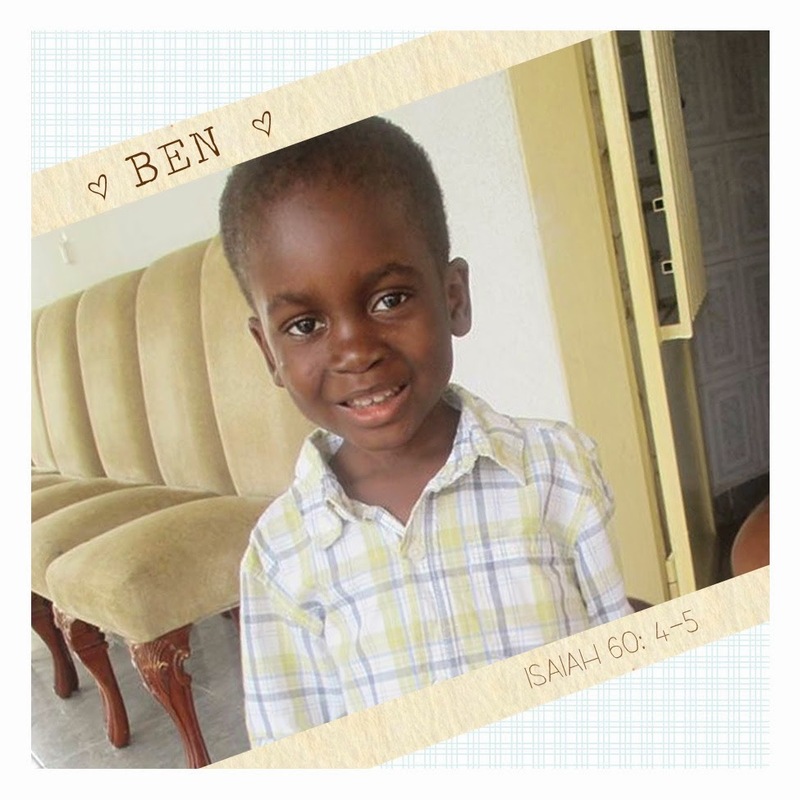 Little Ben Dillow was five years old and had legally been adopted by a family in the US, but due to the Exit Letter suspension he was forced to wait too long to join them here. He had severe medical issues but was not issued even an emergency medical exit letter. Instead, he died without a mother to hold him. My heart ACHES for his family and the loss they have suffered for no good reason. Please keep this family and others affected by this suspension in your prayers tonight. This is an absolute tragedy. This should not have happened (again). This is our motivation. Prayers and warm hugs for the Dillow family. (I stole the above picture from Jenny Marrs' blog over here. (I love her blog.) Click here for more information about Ben and about the Exit Letter Suspension's effects on Jenny's family.